Gittel and her mother are leaving the Old Country to come to America for a better life. But the health inspector tells Gittel’s mother that she is not well enough to travel and Gittel must make the journey alone. But how can she cross an entire ocean by herself and start a new life when she is only nine years old? Gittel’s mother tells her everything will be fine. But will it? 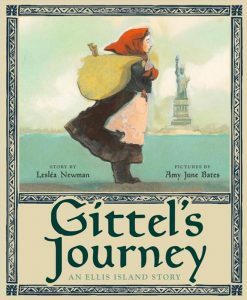 A story of courage, faith, and hope, Gittel’s Journey is based on the true story of Lesléa Newman’s mother’s best friend’s mother, who came to America in 1906! Aunt Phyllis and Lesléa celebrating the arrival of Gittel’s Journey! Gittel’s Journey is based on my own family history, and it seemed the right time to tell the stories of my ancestors, who showed such courage when they decided to risk everything and travel across the ocean in search of a better life. 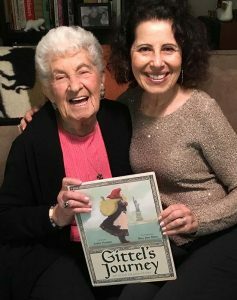 The real Gittel is the mother of my godmother, Aunt Phyllis, who is thrilled that her mother’s story will be read and discussed by thousands of readers of all ages for years to come. Aunt Phyllis and I both hope that the book will inspire readers to treat immigrants and refugees with kindness and compassion. Read more about the real Gittel at the Jewish Book Council. “Why?” Gittel asked. What was wrong with sneezing? Soon Gittel and her mother reached the head of the line. “Stick out your tongue,” a burly man with a bristly beard ordered Gittel. “Blink your eyes. Show me your hands.” Gittel did as she was told. The man nodded, and then turned to Mama. “What is wrong with your eye?” he asked. “I understand all right,” the man said. “Dry your eye and come back to me.” The man turned to the next person in line while Mama wiped her runny eye. Then she returned to the man.